Today Matt Cutts announced via Twitter that Google had taken action against a “large guest blog network”. 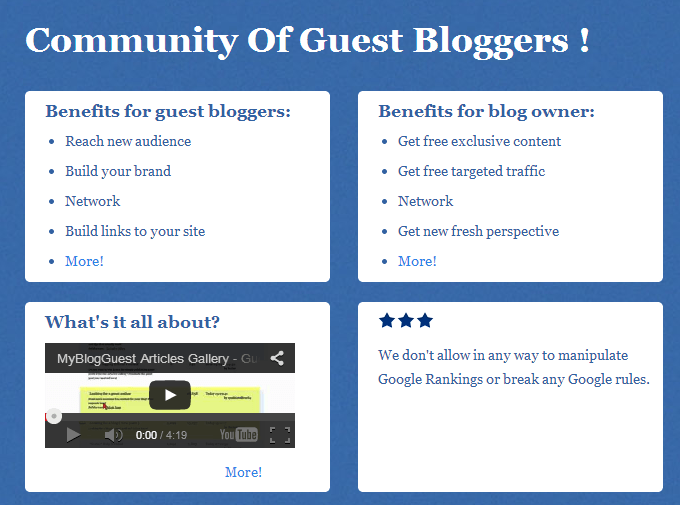 Many have suspected that this mysterious guest blog network is MyBlogGuest.com. This suspicion stems from the fact that the MBG website is no longer viewable in Google’s index when you type in any of the keywords associated with their website. It likely wasn’t a good move on Ann Smarty’s part to say that they would essentially not abide by what Matt Cutts (the head of spam at Google) was suggesting that blog owners do in his latest blog post edition that focused on guest blogging. I think that has really highlighted MBG and they are perhaps suffering from that. I’m actually not sure if Matt Cutts was actually referring to MyBlogGuest.com, as they are against using guest blogging as a means for SEO purposes. Undoubtedly, SEOs would have used this website for other reasons, but I don’t think that is the main premise behind MyBlogGuest.com and they actively police against this. Let’s take a step back for a minute and actually look at MyBlogGuest.com. Secondly, if I submit an article about SEO on MyBlogGuest.com, it would first go through a quality check where my content would be first looked at by a moderator. That really distinguishes MBG as they simply aren’t a low quality article database for blog owners. 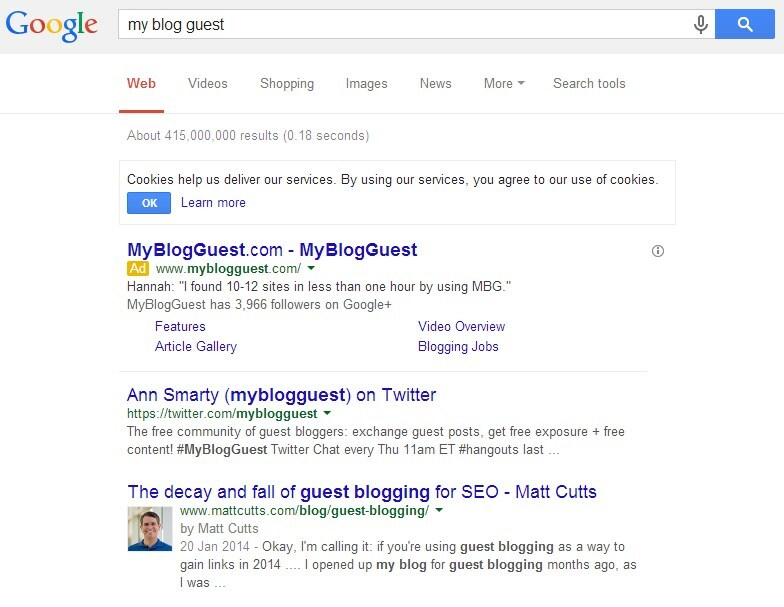 Matt Cutts like to tout about low quality guest posting, but I don’t think that is what transpires on MBG. Essentially both the content creator and the website owner have to manually agree that the placement makes sense for both parties. This would very likely depend on the quality of the website and the quality of the content. I really don’t see the problem here, but apparently Google does. “We are already policing the links: No made-for-SEO links are allowed within our platform (for at least a year now; we’ve been always advocating no-anchor-text links but we started actively policing them 2 years ago, then we stricken the rules even further),” Smarty explained. So, were MBG just another example to spread fear, uncertainly and doubt in the latest of “blogger network” crackdowns by Google? I would certainly say so. Luckily for MBG they do not rely on Google and SearchMetrics data seems to back this up. Whether or not MBG publishers are being punished by this is another question. Google is really overstepping their bounds in penalizing a site that connects authors and publishers. Furthermore, penalizing sites that use the service is a demonstration that Google is finding it too hard to tell the difference between good content and bad. As a consequence, they are using brute force approaches that fail to even check whether the content has quality or not. If an author writes a good quality article, it should be at the discretion of the webmaster whether to publish and provide a backlink. Now Google is saying that webmasters can no longer decide what is good and what is bad. This smacks of a free speech issue. I think this comes down to Google failing to handle how links are being used to manipulate PageRank. It struggles to identify a paid link from one that is not, so is now treating any guest blog (that is connected to a network such as MBG) as a paid link. It’s why they’ve now punished PostJoint and a plethora of other blog networks.